"A Fantasy Webnovel with a Little Bit of Everything." 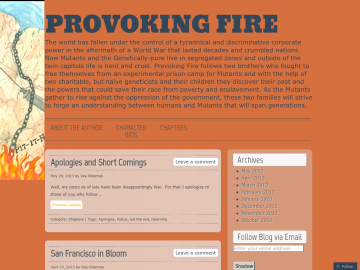 Provoking Fire is a fantasy web novel set in an alternate reality where Earth is inhabited by both humans and mutants, beings that appear to be human, but possess supernatural abilities. The discovery of these super-powered individuals has rocked the globe and in the aftermath of a destructive world war a few humans strive to understand and strike a peace between the mutants and the tech company that reigns the world with an iron fist. Provoking Fire has not been reviewed yet. Provoking Fire has not been recommended yet.